From Marshfield to Manchester-by-the-Sea, beachgoers and boaters in the region are reporting jelly-like animals in our local waters. The jellies float in a chain but break apart into little blobs when agitated. So what are these things? Are they safe? Where did they come from? 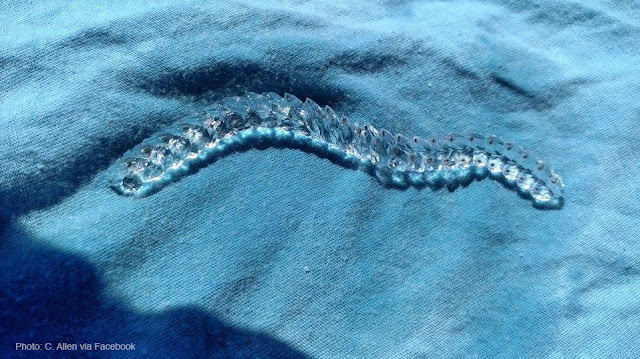 Salps are often found in chain formation, but can bud off into singular jelly-like creatures when agitated. We checked with Aquarist Bill Murphy, the keeper of the cold-water creatures in our Gulf of Maine exhibits. He says they're salps! Here's a video of water thick with salms shared by a Facebook follower C. Allen. Salps are free-floating creatures that feed on phytoplankton—perfectly harmless to humans. Their huge numbers are most likely the result of an algal bloom, though winds and currents can push these creatures into coves and beaches. Our right whale researchers reported so many in the Bay of Fundy last summer that the water almost looked purple in places! Though these look like simple creatures, salps are actually grouped with humans in the phylum chordata because they have a primitive nerve cord during their larval state. That's a precursor to the backbone! Researchers believe these may be one of the first instances of a primitive nervous system. 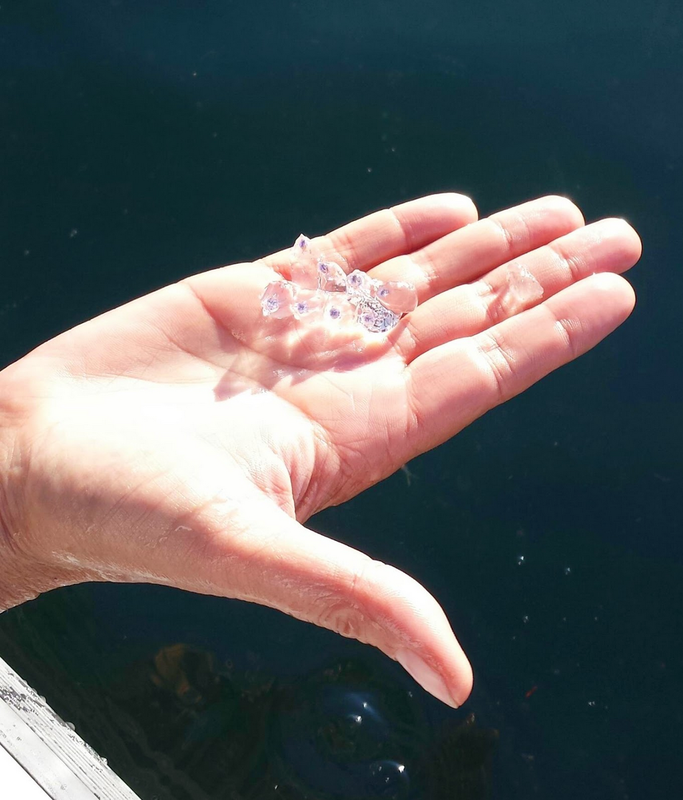 The right whale researchers spotted salps during surveys in the Bay of Fundy last year. Keep your eyes peeled for these interesting animals during your next visit to the beach. Now you can impress your friends with your knowledge of our blue planet. If you really want to bone up on fascinating ocean facts, come visit the Aquarium! Tickets are available online—now with no additional service charge.